Note: This is the full version of a two-part series. Already read part one? Click here to skip to part two. If you’d prefer to listen, you can also scroll to the bottom of this post for an audio version. In the coming days, officials would find out that one “person” had secured not only the $27,036,142 jackpot, but 6 second prizes, 132 third prizes, and 135 minor prizes collectively worth another $900k. What unfolded next was the strangest, most improbable lottery tale in history — one involving thousands of international investors, dozens of complex computer systems, and a mathematical savant who’d masterminded the entire operation from the other side of the world. This is the story of the man who “gamed” the lottery by buying every possible combination. 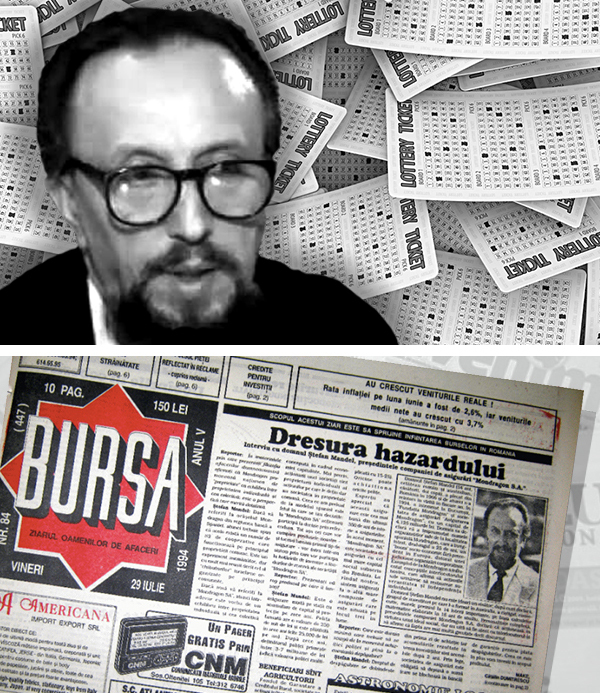 In the late 1960s, a young Romanian economist named Stefan Mandel was struggling to get by. Many Romanians in Mandel’s predicament had, out of necessity, turned to lives of crime. But Mandel, a self-described “philosopher-mathematician,” saw another way out: The lottery. Let’s take a step back here: What kind of idiot banks on winning the lottery? You’re literally more likely to win an Olympic gold medal, have identical quintuplets, or get crushed by a vending machine. 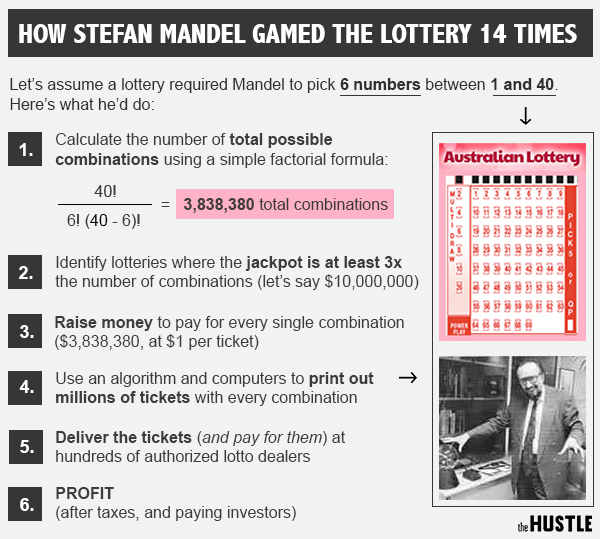 Using the algorithm, Mandel claimed he could accurately predict 5 of the 6 winning numbers, reducing the number of combinations in a lottery from millions to mere thousands. With a band of friends and acquaintances, he took a big risk and purchased large blocks of lottery tickets with the combinations his formula has deemed to be most likely. Miraculously (and with a lot of luck), he won the first prize of 78,783 lei (about US $19.3k). After expenses, he walked away with $4k, enough to bribe foreign ministry officials and flee Romania for a new life — and a bigger jackpot. 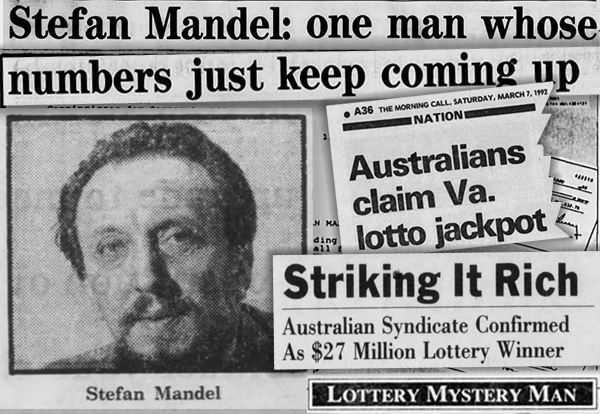 After 4 years of roaming around Europe, Mandel settled in Australia and he set out to game the lottery in a different way. In the typical lottery, a set of numbers within a certain range (say, 1-50) are randomly selected; if yours match in any order, you win the jackpot. The chances of winning are based on the number of possible combinations of these numbers, often in the millions. But Mandel caught on to something: In certain lottos, the total number of possible ticket combinations was significantly lower than the jackpot. For example, let’s say a lottery required 6 picks of numbers between 1 and 40. This would yield 3,838,380 possible number combinations (calculator here). Now, let’s say that same lottery had a $10m jackpot. In theory, Mandel could buy a ticket for every single combination at $1 each and be guaranteed a win — and, after taxes, a decent profit. Mandel maintained that “any high school math student could calculate the combinations.” But this method came with some major logistical setbacks. How would he get the capital? And how could he possibly fill out hundreds of thousands of tickets, number by number? Over a period of years, while working a day job as an insurance agent, Mandel convinced hundreds of investors to pool their money together and create a “lotto syndicate.” He then developed a full-fledged automation system: A room full of printers and computers running on an algorithm that pre-populated tickets with every combination. Computers revolutionized Mandel’s process. Before, he’d been limited to writing out millions of combinations by hand, where a single mistake could ruin 8 months’ worth of work; now, he could outsource the work to a machine. Throughout the 1980s, Mandel’s syndicate would wait until a jackpot ballooned to an amount higher than the total combinations, then “move to buy” thousands of tickets. They managed to win 12 lotteries (and rake in 400k smaller prizes) across Australia and the UK. But Mandel’s system soon hit a wall. For one, the profits were relatively modest (in $1.3m 1987 win, he pocketed $97k after paying taxes and investors). His repeated wins also attracted the attention of Australian lottery authorities, who changed the law multiple times: by the end of the ‘80s, they’d outlawed both computer-printed tickets and bulk purchasing of tickets by an individual. So, he set his sights on much bigger feat — one that would make international headlines and boggle the minds of lottery officials around the world. Using his profits, Mandel planted “scouts” all over North America (Montreal, Boston, Miami, Phoenix, Norfolk), and compiled a list of historical lotteries with jackpots that were at least 3x the total of all possible combinations. After considering Massachusetts ($37m jackpot to 9m combinations), and Arizona ($11m to 5.1m), he ultimately pinpointed the Virginia Lottery. Virginia’s lottery offered several advantages. It was fairly new, and allowed buyers to purchase tickets in unlimited quantities and print them at home. But most importantly, its numbers only ranged from 1 to 44 (other states went as high as 54). This meant that with 6 picks, there were “only” 7,059,052 possible combinations, compared to the usual 25m+. Under the shell corporation Pacific Financial Resources, Mandel set up a trust called the International Lotto Fund (ILF) and convinced 2,524 investors to put at least $3k each in the pot. Given Mandel’s prior successes, the demand was hot: He raised more than $9m. In a Melbourne warehouse, he set up 30 computers and 12 laser printers, and hired 16 full-time employees to print 7m tickets pre-populated with every combination — a process that took 3 months. He then shipped the one-tonne of paper weight to a point-person in the US at a cost of $60k. With the tickets secured in Virginia, Mandel had to wait until the jackpot hit a number that would make financial sense after taxes, overhead, and paying off investors. A state lottery prize typically begins in the low millions and increases every time a drawing goes by with no winner. (When you see those insane $758m jackpots, it means nobody has won in quite some time.) Mandel had to anticipate when to strike, and had to hope for the best that there wouldn’t be multiple winners to dilute the pot and ruin his margins. 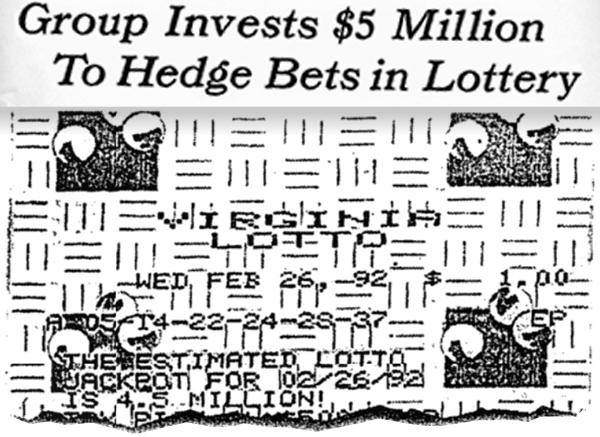 On February 12, 1992, the Virginia Lottery jackpot hit $27m. Mandel’s team on the ground was given a simple directive: Go. And nobody — not even Mandel — could’ve anticipated the the madness that would ensue. As Mandel knew, the “buy all combinations” method of winning the lottery was more of a logistical than a financial challenge. The hard part was yet to come. Tickets could be legally printed at home, but they still had to be taken to an authorized lotto retailer in the US, paid for (at $1 each), and processed. Waltzing into a gas station with 7m tickets and a truckload of cash wasn’t an option. Mandel hired the accounting firm Lowe Lippmann to transfer $7.1m in investor funds to Crestar Bank in Virginia, where it was cut into $10k cashier’s checks. He then lined up advance deals with Virginia-based retail chains to buy the tickets in bulk. All he needed was a point-person on the ground to orchestrate the mayhem. For this task, Mandel turned to an esteemed associate by the name of Anithalee Alex. When his old pal, Mandel, rang, Alex was fresh out of bankruptcy court, with $400k in debt and 16 maxed-out credit cards. He was ready for action — any action. The job was harrowing: He was to coordinate the drop-off, payment, and processing of 7m lottery tickets at hundreds of stores all over Virginia. The jackpot hit $27m on a Wednesday; the next draw would be on Saturday. This meant that he and his team had just 72 hours to pull it off. On February 12, 1992 — 3 days before the draw — Alex checked into a Holiday Inn in Norfolk, Virginia and set up a “command center” at the Koger Center, a nearby business park. In the “88-acre “maze of buildings,” Alex assembled a team of 35 couriers (most of whom were certified accountants) and distributed cellophane-wrapped bundles of 10k tickets with stacks of $10k cashier’s checks. For 2-straight days, the couriers methodically descended on 125 gas stations and supermarkets. At Farm Fresh, Miller Mart, and Tinee Giant locations throughout the region, flummoxed store clerks were asked to buy and process millions of algorithmically-generated lotto tickets. By Saturday evening, the team was nearing completion. Then, disaster struck. One of the chains who’d bought tickets in bulk got overwhelmed and quit in the final hours, leaving millions of combinations on the table. When the deadline for entry arrived, only 5.5m of Mandel’s 7m tickets (78%) had been processed. Mandel’s “fool proof” plan, which relied on securing every single possibility, was in jeopardy. Like a regular lottery, winning the jackpot would ultimately come down to luck. Mandel knew that without 100% of the combinations secured, his strategy was reduced to a multi-million dollar game of chance. He was aware of other ill-fated attempts to game a US lottery by bulk-buying tickets: In a 1990, a Sacramento retiree bought 30k tickets with a diaper bag full of cash and walked away empty-handed; months later, a computer engineer known as “The Phantom” purchased 80k combinations at a Jacksonville, Florida bar and only won minor prizes. Even if Mandel were to win, there was the possibility of multiple winners — a scenario that could significantly dilute the jackpot. At 11:20 PM on February 15th, the numbers were drawn on live television. I nearby warehouse, Alex and his team frantically rifled through 5.5m physical copies of receipts, looking for the winning ticket. Then, piercing through the carnage, a victorious shout: They’d won. “When the $27m ticket came up, everybody was 6 feet off the ground,” Alex later said. “It was the most incredible thing in the world.” Purchased at a Farm Fresh in Chesapeake, the ticket had been processed in the twilight hours. Alex’s diligence had paid off. The $27,036,142 jackpot (and $900k in secondary prizes) was to be paid out in 20 annual installments of $1.03m. But Virginia’s lottery czars had other plans. Although completely legal under both US and Virginia state law, the Australian group’s feat was interpreted as an effort “cheat” the traditional system. Mandel was subjected to a 4-year legal crusade, in which he was personally investigated by 14 international agencies, including the CIA, FBI, IRS, National Crime Authority, and Australian Securities Commission. Meanwhile, in his home country of Australia, he became something of a folk hero: A widely-circulated cartoon depicted him as a kangaroo hopping out of the US with a pouch full of cash — defiant, victorious, and full of life. The investors — small business owners, machine operators, housekeepers, and doctors — had been regaled with tales of riches, and promised participation in up to 9 lottos per year. Yet, they’d only received a $1.4k return on their $4k investment. Meanwhile, Mandel paid himself a one-time “consultant’s fee” of $1.7m, and purportedly sold the annuity on the 20-year payout to a US insurance company for a lump sum of $14m. After overhead fees ($5.5m for the tickets, and $500k in expenses), he was left with a princely sum. Records show that he funneled this cash into the Pacific Basin Fund, a Hong Kong-based account managed by his brother-in-law. “What we calculated to be the reality has changed,” he wrote in a 1994 letter to investors. “It may not seem such a hot investment now.” After that, his investor updates went cold. After failed attempts at launching a life insurance company and a lottery system in the British territory of Gibraltar, Mandel declared bankruptcy in 1995. He then spent the next decade running various investment scams — one of which earned him a 20-month prison sentence in Israel. And what became of the mastermind? Today, Mandel spends his days at a beach house on a remote tropical island in Vanuatu, a country off the coast of Australia. He lives a quiet life and reports being “retired” from the lottery. His legacy lives on in US legislation: All 44 states that run lotteries have enacted laws preventing the profitable replication of Mandel’s strategy. In effect, this secures him a title as the first and last man to ever successfully game the lottery by buying every possible combination. Reflecting back on wilder times, he played off the riskiness of his gambit. Prefer audio? You can listen to the full story below, courtesy of our friends at Curio.